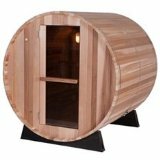 Are dry sauna benefits different from those of a wet sauna? 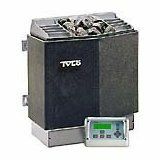 It’s a question most people don’t give a lot of thought to, being “purists” who contend that a real traditional unit, with its invisible löyly steam, profits from both the dry and wet atmospheres. Yet the purists who prefer the feeling of searing heat on their skin definitely prefer the dry sauna. A dry-mode sauna is one that is operated without the benefit of moisture. Hot rock or Finnish saunas can be operated dry (meaning no water is poured on the rocks to create steam) and infrared saunas don’t use water or rocks, so there’s never any steam. Both of these dry sauna types promote a beneficial fever in the body and induce sweating, the body’s highly effective two-step detox program. 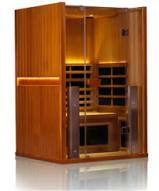 Dry sauna benefits occur when the bather is able to sweat, thus purifying the body of toxins and viruses. The high dry heat of a hot rock sauna is beneficial to the cells in your body especially those on and just under the surface of the skin. As the body’s temperature increases, sweat glands and oil glands work to secrete oil and fat-soluble toxins. The bather then washes off the skin in the shower to complete the beneficial detox process. 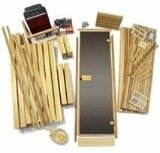 The benefits of a dry infrared sauna can be explained this way: FIR or far infrared saunas use ceramic emitters instead of a heater stove to penetrate deep into your body without heating the air in the room. The beneficial rays of a far infrared sauna do not sear the skin like a dry-mode hot rock sauna as the room temperature stays at a more pleasant maximum of 130° F, but still gives the body a deep detox. Despite the lower temperature, the FIR is believed to offer more dry sauna benefits than a hot rock sauna as it induces 2 to 3 times more sweating which relates to more calories burned. But haven’t benefits such as the theory of losing weight in a dry sauna been debunked? No, as the Journal of the American Medical Association stated, a bather in moderate condition who sweats off about 500 grams in a sauna nevertheless uses up some 300 calories - or the equivalent of running a couple of miles. The Journal went on to observe that while, yes, the water weight is regained once you rehydrate, the calories that were consumed in the sauna are not. As your internal body temperature rises to about 100.4° F during a 10-20 minute dry sauna session, your heart rate increases by 50-75%, and this beneficial and temporary fever works to draw out toxins, clean clogged pores, kill harmful bacteria and viruses, increase circulation and metabolism, and enhance the immune system. The benefits of this artificial “hyperthermia” can be compared to the increased cardiac load put on the body during physical exercise. Combined with the purifying aspects of sweating, these dry sauna benefits are reasons enough to include regular sessions in a hot rock or infrared sauna as a part of your overall health and wellness regime.